Do you know West Java in Indonesia? There is a huge Mountain called Tangkuban Perahu. Tangkuban perahu is a volcano, 25 kilometers north of Bandung direction of Lembang. Its location is in between Sagalaherang village, Sagalaherang district, Subang regency and Cikole village, Lembang district, Bandung regency. Mount Tangkuban Perahu - Volcano in West Java near of Bandung city. This is Bandung's most famous tourist volcano just 28 km north of the city. This volcano offers many places to see and explore. Whether we look into the huge crater or hike down into it, stroll through the forest on its slopes, or simply enjoy the splendid panoramic scenery. Mt. Tangkuban Perahu is an interesting destination that everyone in the Bandung area is fond of visiting. When seen from Bandung, Mt. Tangkuban Perahu has a distinctive shape, like an upside down boat. Tangkuban Perahu means, in fact, "up-turned boat" This peculiar shape has stimulated the fantasy of the Sundanese people from early times as expressed in the Legend of Sangkuriang. Geologically, Mt. Tangkuban Perahu has played a significant role in the development of Parahyangan highlands. Eruptions have contributed immensely to the hills north of Bandung through lava flowing into the valleys and hardening into rock, thus forming big cliffs over which waterfalls leap. Likewise, mud flows have formed a semi-circular cone of gentle gradient (what geologists call "a fan"), which is now a mass that blocked the valley of the ancient Citarum River near present day in Padalarang (some 18 km west of Bandung), this caused a lake to form covering the whole Bandung plain. Tangkuban Perahu is a volcano with three craters into which areas tourists can walk through. These three craters are: Kawah Ratu ("Queen Crater"), Kawah Domas ("Domas Crater"), and Kawah Upas ("Upas Crater"). Tourists can go down into the Domas Crater where exist many hot geysers in which they can boil eggs. Though the mountain appears peaceful, mild eruptions occurred in 1969, when Kawah Ratu spewed ash and barrages 500 m high. As recently as September 1992 it was closed to the public for a few days because unusually high seismic activity leads volcanologist to fear a new eruption. On the mountain's northern flank is an area called Death Valley, so named for its frequent accumulation of poisonous gases. On a reasonably clear day, from Kawah Ratu, the main crater, we can see not only the mountain range to the east, with Mt. 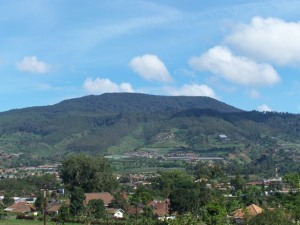 Bukittunggul as its highest peak (2,209 m), but also two other in a northeasterly direction. The lower and nearer one is Mt. Tampomas (1,684 m) just north of Sumedang some 40 km away. To the right and about 90 km away is Mt. Ciremai close to Cirebon on the north coast. At 3,078 m, Mt. Ciremai is West Java's tallest mountain. At the foot of Mt. Tangkuban Perahu we see the Ciater tea plantation covering the rolling hills. Farther to the left are the northern coastal plains of Java, and on an extremely clear day we may even be able to see the Java Sea beyond. 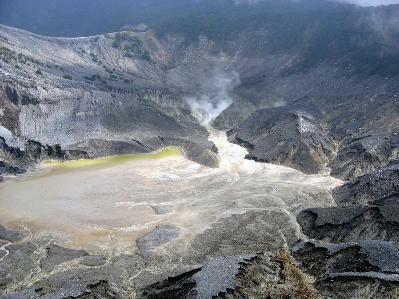 Kawah Ratu, which means "Queen's Crater", is today just a big gray hole, which sometimes has a pool of water at its center. Poisonous gases sometimes accumulate in Kawah Ratu, thus making it somewhat of a risk to descend to the crater floor. Beyond the saddled shaped depression on the far side of Kawah Ratu is the still active Kawah Upas, the oldest crater on the mountain. On the very far western cliff we see a spot where all vegetation has been destroyed by constantly rising sulfurous vapors. On the crater walls, note the various layers of material consisting of rock, sand, and pebbles. Overtime, new craters have formed again and again in a rather consistent shift from west to east. The most well known of these is the Domas crater, but also there are other smaller ones in jungle on the mountain's northeastern flank. Facilities in Tangkuban Perahu Crater are comfortable parking area, souvenir kiosks, and restaurants.